Khosravifard, A., Moshksar, M., Ebrahimi, R. (2012). Mechanical Behavior of TWIP Steel in High Strain Rate Torsional Test. International Journal of Iron & Steel Society of Iran, 9(1), 15-19. A. Khosravifard; M. M. Moshksar; R. Ebrahimi. "Mechanical Behavior of TWIP Steel in High Strain Rate Torsional Test". 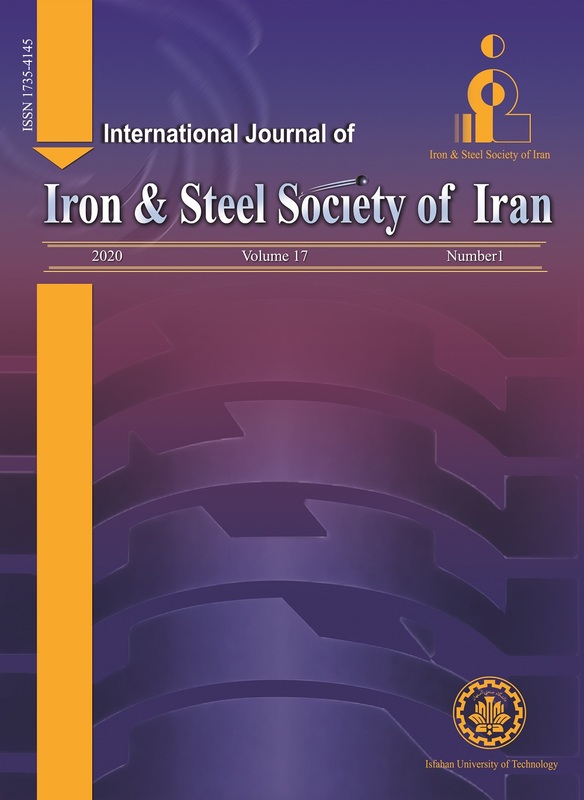 International Journal of Iron & Steel Society of Iran, 9, 1, 2012, 15-19. Khosravifard, A., Moshksar, M., Ebrahimi, R. (2012). 'Mechanical Behavior of TWIP Steel in High Strain Rate Torsional Test', International Journal of Iron & Steel Society of Iran, 9(1), pp. 15-19. Khosravifard, A., Moshksar, M., Ebrahimi, R. Mechanical Behavior of TWIP Steel in High Strain Rate Torsional Test. International Journal of Iron & Steel Society of Iran, 2012; 9(1): 15-19. Advanced high strength steels (AHSS) have recently attracted great attention because of their superior mechanical properties. A modern group of these steels, known as twinning induced plasticity (TWIP) steels, shows a unique combination of strength and ductility even at high rates of strain. In order to examine the functionality of such steels in dynamic loading conditions, their mechanical behavior should be characterized by high strain rate experiments. Regarding the precision of its results and characteristics of the loading pulse, the torsional Kolsky bar experiment has well-known advantages over similar high rate experiments. In this study, a high strain rate torsional testing machine was designed and constructed. By using high strain rate torsional experiments in the range of strain rates from 500 to 1700 /s, mechanical behavior of two high manganese steels with different levels of carbon (0.49 and 0.07 wt%) was surveyed. Through the experiments, it was observed that the phenomenon of adiabatic temperature rise considerably decreased the work hardening rate during the dynamic testing of the high-carbon steel, whereas the low-carbon steel showed a definitely higher hardening rate. The influence of pre-straining on the dynamic mechanical behavior of this low-carbon steel was also studied. H. Kolsky: Proc. Phys. Soc., 62(1949), 676. J. Harding, E.O. Wood and J.D. Campbell: J.
Mech. Eng. Sci., 2(1960), 88. Z. Xiong, X. Ren, W. Bao, S. Li and H. Qu: Mater. Sci. Eng. A, 530(2011), 426. D.M. Duarte, E.A.S. Ribeiro, B.M. Gonzalez, E.V. Pereloma: Mater. Sci. Eng. A, 528(2011), 3545. Vaghefi: Mater. Des., 31(2010), 3395. O. Bouaziz, S. Allain, C.P. Scott, P. Cugy and D.
Park, ASM International, (2000), 1134. O. Bouaziz: Mater. Sci. Eng. A, 483-484(2008), 184. G.B. Olson and M. Cohen: Metall. Mater. Trans. H.R. Abedi: Mater. Des., 40(2012), 556. D. Barbier, N. Gey, S. Allain, N. Bozzolo and M.
Humbert: Mater. Sci. Eng. A, 500(2009) 196.